He is most famous for five volumes known collectively as “Makers and Finders: A History of the Writer in America, 1800-1915,” the most well-known of which is The Flowering of New England, 1815-1865, published in 1936, winner of the Pulitzer Prize and the National Book Award. The other volumes are New England: Indian Summer, 1865-1915 (1940); The World of Washington Irving (1944); The Times of Melville and Whitman (1947); and The Confident Years: 1885-1915 (1952). Scott Berg’s Max Perkins: Editor of Genius (1978) recounts the harrowing years when Brooks was unable to write because of a mental breakdown, and how Perkins helped him climb back out of his psychic abyss to become one of the 20th century’s most prolific, if now forgotten, authors. 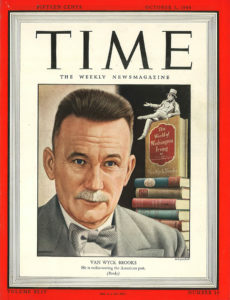 Brooks himself was the focus of Raymond Nelson’s Van Wyck Brooks: A Writer’s Life (1981), and his long friendship with critic Lewis Mumford was detailed in Robert E. Spiller’s edited volume of their letters, The Record of a Literary Friendship, 1921-1963 (1970). I am thoroughly enjoying The World of Washington Irving, being a huge fan of Irving, but the book’s canvas stretches far beyond, covering a host of other writers from Edgar Allen Poe to James Fenimore Cooper, John James Audubon, William Gilmore Simms, and lesser luminaries whose stars have long since dimmed. There is a treasury of learning here, and it is a pleasure to read. Van Wyck (rhymes with bike) Brooks was widely lauded during his own day with awards and honorary degrees, but as Patton so rightly noted, all glory is fleeting. When Brooks died in Bridgewater, Connecticut in 1963 at the age of 77, his town decided to build a library wing in his honor. The effort died after ten years of meager fundraising, only to be revived when a California hermit who admired Brooks’s writing left the library $300,000 in his will. The wing was finally dedicated in 1980. Gaining new strengths for the struggles ahead, be they against personal demons or the next global firestorm: still one of the best reasons I’ve ever heard for reading books like this, then or now. This entry was posted in Books, Culture, People on April 3, 2018 by Stan Deaton.